Product prices and availability are accurate as of 2019-04-12 21:38:13 EDT and are subject to change. Any price and availability information displayed on http://www.amazon.com/ at the time of purchase will apply to the purchase of this product. Make your entertaining green. 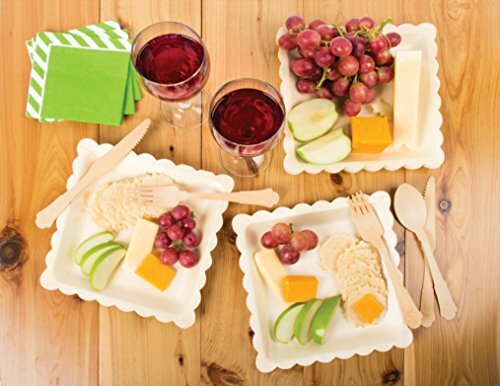 Food safe and disposable utensils are a stylish alternative to plastic silverware. Made with sustainable Birchwood and natural vegetable dyes, this set of cutlery is completely biodegradable and recyclable. 18 pieces total - 6 each of forks, knives and spoons. Coordinate beautifully with wood grain patterned disposable party plates, napkins and paper straws to lend a natural feel to any event or place setting. 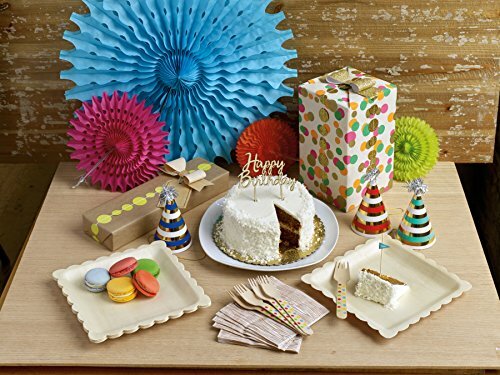 Let Party Partners Design do your party a favor. More than a party, it will be the most talked about event of the year. A vintage-inspired collection of time-tested classic party supplies. Party Partners' festive decorations have been regularly featured in magazines such as Good Housekeeping, Cookie, Parents, Country Living, Martha Stewart Kids, Martha Stewart Weddings and Better Homes and Gardens. Kooky old-fashioned party supplies and favors, let the party begin.